Okay, okay. I know we've already reviewed a holiday episode of this show, and it seems a little odd to spend the time writing up another installment of a cooking show: these aren't exactly driven by characters or plot, after all. We watch these on Hulu, incidentally, which is why we're a few years behind. They're basically our dinner entertainment during the non-holiday-rush portion of the year, when we're not forced to binge every Christmas special we can come across for fear of awakening the Old Gods should we stop. Not just in itself - the series is a lot of fun to watch, thanks to the sabotage gimmick that brilliantly upsets the level playing field most cooking competitions obsessively cultivate. Sure, that's interesting enough on its own, but Lindsay covered that when she reviewed the 2014 holiday episode. No, this one is interesting as an exercise in both holiday adaptation and in how this particular competition highlighted some of the game's dynamics. In short, this may be the quintessential episode of Cutthroat Kitchen, the one that best exemplifies the merits and limitations of these rules. This is a "special episode," which means a lot less in season 10 than in earlier years. Frankly, by this point every other episode is presented with some sort of added gimmick or twist. This one, as the title suggests, sets out to determine which is better: being naughty or nice. To do that, they bring back four chefs from earlier seasons, two deemed "nice," and two who are "naughty." That's not the interesting part. Honestly, they could have pulled damn near any chef who made it past round one and slapped a "naughty" label on their back. The show is edited to make their cooks look as cutthroat as possible, even when it's clearly in good fun. The two "nice" chefs were chosen on the basis of their personalities, not for any kind of aversion to sabotaging opponents - everyone understands the rules. In addition, while they were nominally divided into these categories, they weren't on any sort of teams. All that said, the nice chefs get taken out in rounds one and two, so maybe there's something to this, after all. Round one's challenge is a party dip, which at least qualifies as Christmas-related. The sabotages are having ingredients switched for Christmas stockings full of wrapped food, a "Little Drummer Boy" prep station, and having to carry a "North Pole" toy for the last half of the challenge. The stocking challenge hit three chefs, while the other two only targeted individuals. The first of the "nice" chefs was sent packing to sad holiday music. Alton did break tradition by not sending the loser home with nothing, though: she got a piece of coal. Round two was for a beef tenderloin dinner. While the holiday connection seems a little forced on the entree, the sabotages were Christmas through and through. The first sabotage had one chef cooking on a lump of coal, the second required two chefs to wear reindeer antlers and pull a sleigh holding someone in a Santa suit through the entire challenge. This has to be one of the most inspired sabotages I've ever seen on this show. It was fun to watch and looked painful to do, but despite having to haul Claus around their prep stations and stoves, the two chefs given this survived. The one who got the lump of coal to cook on got sent on his way. The third round opened at an interesting point. Both remaining chefs had saved the majority of their money: one had $19,500, and the other still had his full $25,000. It's fairly unusual for this much money to be left in the game by this point, though not as unusual as it should be. Players often to spend their money in retaliation against whoever just sabotaged them, which is a misuse of money. The goal in the early rounds isn't to be the best; it's to not be the worst. They'd be better off targeting players who haven't spent any money or who already have sabotages. The final round challenge was "to make Santa a snack." The first sabotage was a miniature prep station decked out like the North Pole, complete with elves (i.e. : actors dressed in elf uniforms) working on toys inside. The bidding climbed to $7,000, and the chef who hadn't spent a penny won it. In hindsight, this was when the remaining chef lost, because she made a critical mistake: she stopped bidding. This is an extremely common error made by contestants on this show: they conclude their opponent will spend whatever it will take, so they drop out of the auction. It's as much a resource control game as it is a cooking competition. It costs NOTHING to lose an auction. The second sabotage was an advent calendar-themed ingredient swap. After losing everything they had, they get to open the first five drawers of a giant advent calendar, use those for five minutes, then get another five drawers (and so on). The chef in the elf house assumed she'd win this fairly easily. She actually had a little more money than her opponent at this point. But, while she had more money, she also cared more about the prize at the end. By bidding nearly everything, he got her to drop out, and she was stuck with both sabotages. This gets to a core question of the show: why are the contestants playing? The unusual rules give the contestants an abnormally large degree of control over what they're playing for. Anyone on Cutthroat Kitchen has the option of playing for $25,000, with the caveat they'll almost certainly lose (since they'll be saddled with all the sabotages in the last round and almost certainly a high number in the earlier rounds). Naturally, the majority of chefs aim for a more modest prize or try to go on instinct. But occasionally someone like Jean-Paul comes on the show with the sole goal of winning. If he'd been forced to spend, say, half or more of his money on the first sabotage, he couldn't have forced his opponent to choose between playing for almost nothing or facing long odds. Because of this Jean-Paul won, taking $800 with him, the lowest prize in the series's ten-year history. I said before that I'm something of a fan of the show, but this loophole does strike me as a bit of an issue. Chefs who are better off financially have an incentive to play far more recklessly, in part because there are other benefits to winning. Some chefs have gone on to other Food Network shows, like Next Food Network Star, and/or written cooking books. Likewise, being able to hang a sign in your restaurant boasting about a victory could pay off in the long run. I don't blame Jean-Paul for his priorities, but I feel like his opponents should be better prepared - either by the producers or on their own - for the non-cooking elements of the game. If you want to win with a decent amount of money, you need to strategically eliminate the amount of money held by your opponents, either by targeting those who hold onto their funds (as Jean-Paul did in the first two rounds) or by forcing them to spend a significant portion on the first sabotage of the final round. Occasionally, chefs will get lucky and win despite having all the round 3 sabotages (a chef has walked out with the full $25,000... once), but as a rule of thumb, you're better off treating this like a game of strategy. And this episode, more than any other I can think of, illustrates that fact. The holiday elements here were fairly obvious. Sure, some of the challenges had questionable connections to Christmas, but the sabotages were delightfully festive. That sleigh in round two, while not insurmountable, was hilarious to watch. It did a fantastic job blending in whimsy without creating a situation where one of the chefs was guaranteed to lose (in fact, both made it through the round). Most of the challenges in this episode were fun, but that was definitely my favorite. There's actually one other Christmas episode this season, just a few episodes later. It's called "Holi-Dazed and Confused," and it's also a great mix of seasonal sabotages and returning stars. 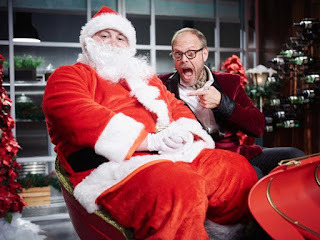 If you're a fan of this sort of silly, cooking competitions, it's just as much fun as Naughty Vs. Nice: I'll recommend both without reservation (and same goes for this entire series, if you're looking for something fun to watch). But it doesn't provide anywhere near as revealing a look into the structure of the game as Naughty Vs. Nice, which set a series record while reveling in holiday cheer. You've got to appreciate that.